Dan Simmons can write just about any genre he takes a stab at and be good at it. Carrion Comfort for horror, Crook Factory for War/thriller and of course the Hyperion Saga for some of the best SF ever written. Ilium is a meta-literary meta-historical science fiction story. That's a lot of meta. I better explain the "meta-literary" and the "meta-historical sf" bits a bit. The thing is, most of the story takes place in and around the attack on Ilium in Homers Iliad, some of it takes place among people who might as well be the Eloi from Wells The Time Machine and the rest included two ... beings whos main interests are Proust and Shakespeare (besides asteroid-mining and diving in the seas of Europa). The story of the Iliad is a lot more real in this book, than real history is today. The story of the Iliad is told by Thomas Hockenberry, a 20th century literature professor with a speciality in the Iliad, who has been revived to keep an eye on the "re-enactment" and make sure that everything follows Homer story. Unfortunately, for him, he gets caught up in the internal affairs of the gods, dramatically lowering his chances of survival. Mean while, back on Earth, a couple of the old-style humans has decided to try to contact the post-humans. And mean while further out in the solar system, the beings that live out here has decided to take a closer look at Mars where (ungodly-) large amounts of quantum-shifting takes place - more than what's good. Simmons has created an amazingly interesting and various world. When I started on it I was a bit worried that, the fact that I haven't read The Iliad, or any Proust and nearly no Shakespeare, would ruin the book, but fortunately it didn't. I'm probably missing out on a lot of stuff, but in this case, the old saying of "what you don't know about, can't hurt you", can probably be applied in some way. If it wasn't for the fact, that by the end of the book, the story of the original Iliad has become largely irrelevant, I would probably have gone out and read or made an attempt at, Homers Iliad, before I throw my self a volume 2 (titled: Olympos). 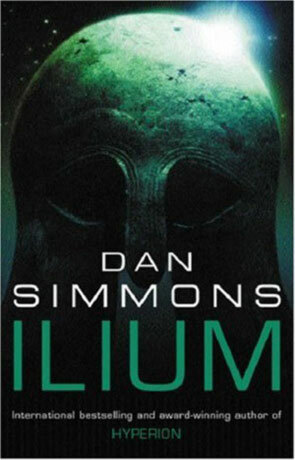 Ilium is Simmons best writings since Hyperion. As a standalone book, I would be tempted to say that it's better that Hyperion. But comparisons like that at really hard to make. The stories are very different and will probably appeal to different people, but there can't be any doubt that, the story aside, the writing it self is Simmons finest. The characters are interesting, mostly likeable and have enough dimensions and depth to be able to change and grow. We may have another winner on our hands here. Just finished the book. Not a bad story, but it was really three different stories wrapped up in one book that only really start to have anything to do with each other right at the very end of the book. The story leaves a number of loose ends which will be concluded in a forthcoming book. The book deals with the Trojan War and Greek Mythology, a human population on Earth which are pretty much Eloi in nature, and artificial constructs from the space around Jupiter. Written on 1st June 2004 by TC.